byogman wrote:If it is an emergency, don’t they have flashers/sirens to get through traffic and lights? The trails are narrow and aren’t made for heavy vehicles and speed. Roads are, go everywhere, and with these aids seem like they ought to be the fastest thing possible. And nobody on the trail anticipates something moving fast around a bend, over the next rise, whatever, so they’re creating a real danger. Those joggers blasting music in their headphones are in their own little worlds. This might be most dangerous to them. I’ve straight up yelled at people and they were still surprised when I squeezed around their group running 4 or 5 wide. byogman wrote:Forget about our space vs. theirs, it’s just dumb. If it’s not an emergency, they’re not special, and it goes without saying that any motorist should be following conventional rules of the ROAD. If it is an emergency, don’t they have flashers/sirens to get through traffic and lights? The trails are narrow and aren’t made for heavy vehicles and speed. Roads are, go everywhere, and with these aids seem like they ought to be the fastest thing possible. And nobody on the trail anticipates something moving fast around a bend, over the next rise, whatever, so they’re creating a real danger. The only reason I can see that an EMT vehicle should be allowed on the trail is if they’re responding to an emergency on the trail itself. Sounds like your argument is about their space vs. ours. Enjoy the day. Kinda, I was just taking a step back to explain my perspective in detail rather than relying on what people already take for granted when using words like mine, yours, belonging, etc. The reason being that different people take different (and sometimes directly opposed) things for granted and then can’t talk to each other. During big events I’ve seen EMT guys on bikes and seagways. Ahlir wrote:??? ?? ?? ???????? It’s not OK with Cyrillic. if you quote. I think problem is that I use UTF-8 and not CP-1251/1252. I don’t have the mad skills, but I want this!!! The railroad tracks would become my highways! 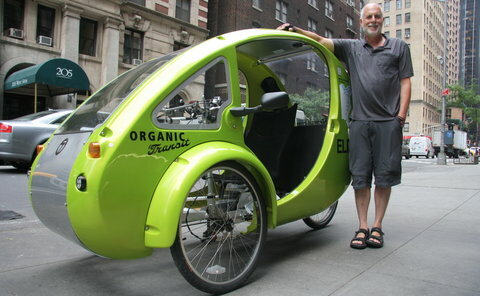 The Elf, an electric tricycle, $5000. Top speed with motor alone, 20 mph, range on one battery charge: 20 miles, range per day with motor+pedaling: 60-90 miles. It looks like fun but I hope it doesn’t show up on our trails. I’d rather see it on the roads with cars than on the trails with bicycles and pedestrians. On Friday of last week I was heading up past the soccer fields in the Hollow and noticed a couple just sitting there with lawn chairs right at the path just looking out. Thought that was odd, then I see why. Probably a 6 year old girl and 8 year old boy riding an ATV (quad) along the trail for fun. Today I saw a very confused looking fellow driving his car on the paths through Point State Park. He slowly went under the bridge, with everyone in the park gawking at him, and headed toward the blockhouse. It didn’t look like a service vehicle or security/police, either. Crazy. Incident along Montour Trail by the Robinson YMCA this evening. At least two vehicles that I know of apparently ran off of Montour Run Rd and into the creek bed. Guessing that the two flatbed haulers and tow truck that were on scene entered the trail at Brothers Grim. Well over an hour of the trail being completely blocked by the flatbeds between when we first saw them heading out, and when they were extracting the second vehicle during our return trip. And they were still knee deep in the process at that point. Unconfirmed report from another trail user that one person was transported to hospital, and another was transported to the clinker. Yikes! Will we start seeing electric skateboards on the trails, soon? Ugh. I hope not. These look fun, but we should keep them off bike & pedestrian trails. specs: max speed is 11 mph, range is 18 to 36 holes of golf, which works out to 4-8 miles. $3600. Meanwhile, the simpler zboards (small, smooth wheels like a skateboard) sell for $650. paulheckbert wrote:Will we start seeing electric skateboards on the trails, soon? I don’t really see the harm. It’s one thing if they’re go 25 and/or pack a wallop due to weight, but neither seem like issues here. The more people that use the trails the more demand there is for trails, the more get created, the more useful that network becomes. … and a truck came around this bend at me way too fast for the trail. I screeched to a halt because he was taking up the entire trail and he wound up scraping the entire front/side panel of the truck against the stone wall on the other side to avoid a collision. It’s not unusual for me to see white Public works trucks on the Eliza Furnace Trail. They are typically getting on the trail under the Birmingham Bridge and then traveling to the end of the trail and the Public Works garage. I’ve complained about this before but those complaints have been dismissed, I am told they are doing authorized work, but the conditions I seem them under makes me think that they are using the trail as a shortcut to get past rush hour backups at 2nd Avenue and Bates Street. They are always traveling too fast because I know I can crank it up to 25mph on my bike but the trucks are always able to easily pull away. I’m OK with the battery skateboards if they can only go 11 tops. Most of the inertia will be from the rider’s body, and that isn’t much different from ambient trail speed anyway. Similarly, I haven’t seen too many Segways on the trail, but don’t have much problem with them being there, either, for much the same reason. Now if they soup them up to go far faster than ambient speeds, that’s something else. Personally, I don’t have a huge issue with cops on motorcyles occasionally riding on the EFT or other trail. As long as they are considerate, and keep their speed moderate, I appreciate the perception that it makes me safer as a trail user. Gas/electric motor vehicles are designed to be used on trails only (or primarily) as a mobility assist device. Not just for grins. The problem is, no one really has the authority to ask what the mobility impairment that requires one to use such a device is. So it can be, apparently, that they rider can’t get up Greenfield Avenue to get home under their own power or something. Otherwise, its more of an ADA issue. Federal funds have gone into most trails. That assures universal accessibility. It a mobility aid is required, it has to be permitted, although each trail can establish limits/parameters. Electric skateboards? Hmm, that’s a tougher sell. Although it sounds like it would be a lot of fun to try! Kordite wrote:…I’ve complained about this before but those complaints have been dismissed, I am told they are doing authorized work, but the conditions I seem them under makes me think that they are using the trail as a shortcut to get past rush hour backups at 2nd Avenue and Bates Street. Even if they are doing authorized work, the drivers of those vehicles have no right to violate the posted 15 mph speed limit. Keep logging complaints, and make sure you note any identifying numbers, time of day, conditions, etc…. If 311/DPW won’t respond, maybe KDKA will? I can’t see golfers using those “golf boards”. a. It might actually make it “fun”. b. No place for booze. I imagine more of a market for some kind of hover suit, like Baron Harkonnen’s. With the skateboard speed limited to 11 mph, they could get passed by a few of the better distance runners in town. This happens several times a day. It’s fun to watch hitched trailers backing up on a narrow trail for a few hundred feet. Sometimes it takes a good ten minutes. @rustyred: So that’s on the North Shore Trail near the West End Bridge? Why are the trucks on the trail? Are they using it to turn around? My best guess is that a GPS unit is telling them that the trail is a road to get to the Casino. They’re turning down Kroll Drive from Beaver Ave, turning onto the trail and when they get to the barrier under the WEB, they have to back up several hundred feet to get back to Kroll Drive. We’ve seen Access buses, delivery trucks, small cars, and today a tractor trailer all trying to take the TRHT. The Cardello Building has a horse up, but they drive right around it or over it. Someone should put barriers at the end of Kroll Drive. I’ve notified FOTR. I assume they are aware of the issue, but if they weren’t they are now! Thanks for the photo, Colleen…..it adds a nice perspective to the problem. @rustyred: I shared your comments with Jeffrey McCauley of Friends of the Riverfront, the group that manages that trail (I believe it’s called the Chateau Trail at that point). Hm, security of Casino parks their car from time to time on the trail. I’ve complained and they moved the truck. So, on my lunch hour just now, I noticed another box truck doing the backup. I rolled up to the driver who had the window down (to see where he was backing up) and just asked him: “You look lost…Did your GPS unit tell you to come down here?”. He apologized and asked me to help him back up without squishing anyone or anything. Seems like a GPS issue. The bollards that were installed at the end of Kroll drive seem to be helping, I haven’t seen a truck back there in a long time. YESSS! I was on the steel valley trail, and saw someone on a small dirtbike, with a small child sitting on the handlebars. They were going pretty fast, more than the legal limit. My views on this when it says no motorized vehicle, it means exactly that. Don’t matter if it is electric, gas, plutonium, nuclear, water powered, etc. No motorized means just that. What is so dang difficult about this?? So glad to see those gates removed on the chateau trail. Havn’t gone by there recently. need to check that out soon. Good work north side bike ped committee! The gates were also brought to the attention of DPW via cyclists on Twitter and I know there was some action on the part of Darlene Harris’ office, as well. The trail itself isn’t in great shape due to an old retaining wall in the river which will take more time and money to fix beyond any short term fixes.